One of India’s most popular tourist destinations, Agra holds an important place in history as it is home to many architectural wonders from the Mughal era. Each famous site has a story of its own that both tour guides and locals love to talk about. 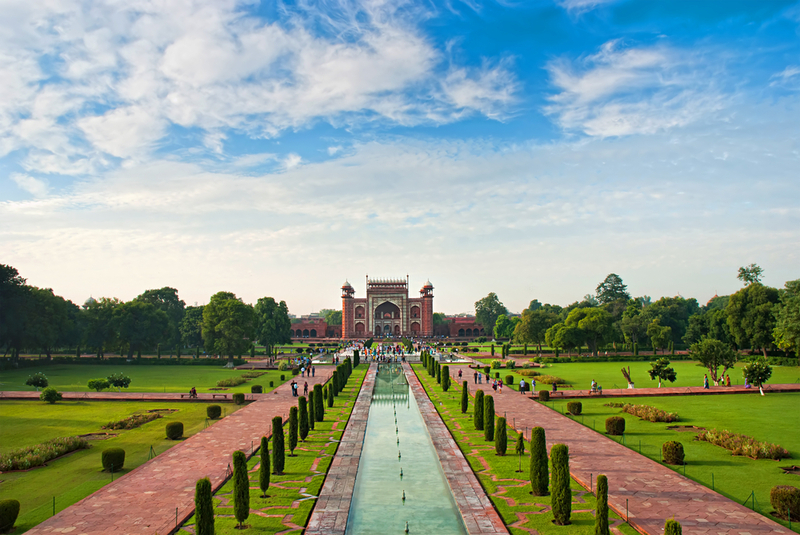 To truly experience Agra like a local as well as a tourist, we have put together a guide to eight famous places everyone should consider having on their travel itineraries. 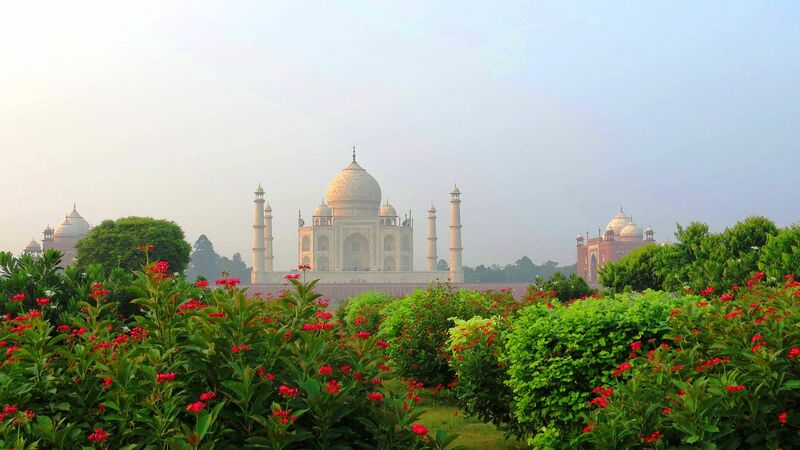 People from all around the world may not have heard of Agra, but everyone knows the beautiful ivory white-marble mausoleum, Taj Mahal, as the icon of love. This wonder of the world is the perfect example of the intricacy and brilliance of Persian and Mughal architecture. 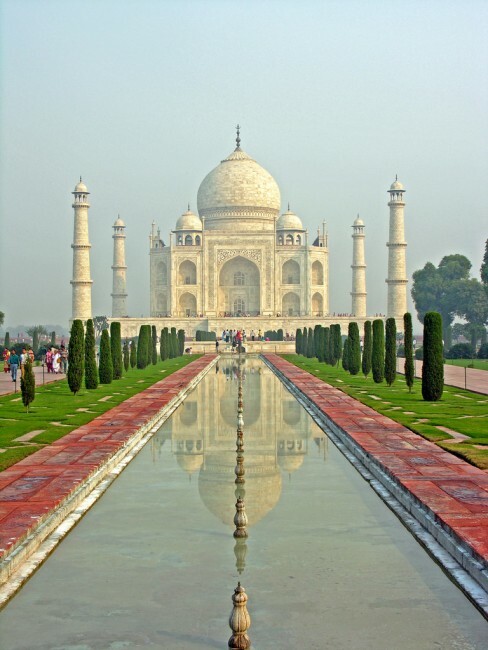 It was constructed by Emperor Shah Jahan, in memory of his beloved wife, Mumtaz Mahal. Today, the Taj Mahal is a UNESCO World Heritage Site and it continues to hold the same magical appeal, attracting approximately eight million tourists a year. Viewing of the Taj Mahal is usually from sunrise to sunset, except Fridays. Night viewing of the Taj Mahal is only allowed on five nights of the month: the night of the full moon and two days before and after. Opening Hours: 6 a.m.–7 p.m. Constructed just opposite the Taj Mahal, Mehtab bagh is a char-bagh (four garden) complex that is considered the ultimate viewing point of the magnificent marble mausoleum. The garden is open from sunrise to sunset and is considered a photographer’s haven because it is the point from where you can take some unique photographs of the Taj with a gorgeous backdrop. 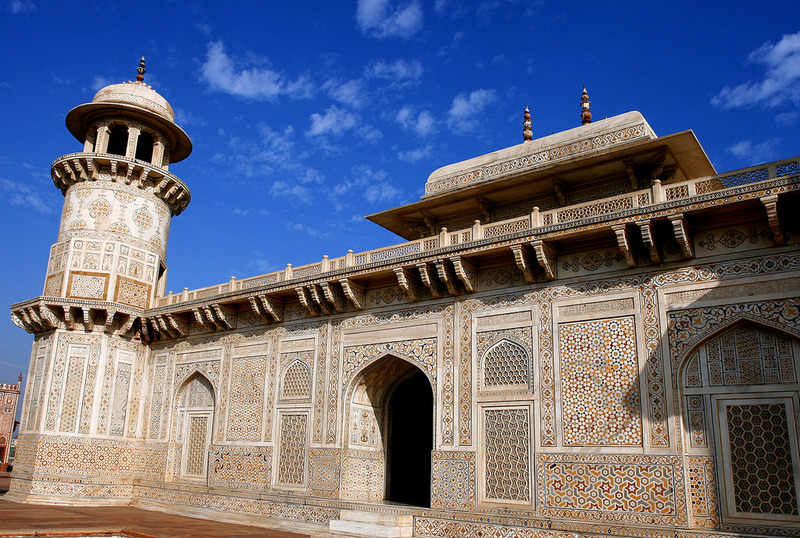 This tomb is the first to be built in white marble instead of red sandstone, which officially marked the cessation of red sandstone from Mughal architecture. Itimad-ud-Daula is sometimes referred to as the “baby Taj” or a draft of the Taj Mahal, as it has been constructed with the same elaborate carvings and pietra dura (cut-out stone work) inlay techniques. The tomb is surrounded by beautiful gardens that make it the perfect site to relax and experience the beauty of an old era that was rich in art, culture, and history. Opening Hours: 8 a.m.–12 a.m.
To experience what most of Agra felt like many years ago, Kinari Bazar is the perfect place to visit. Located in the narrow streets behind Jama Masjid, where multitudes of colorful little shops spill over, women bargain and cars dodge one another. 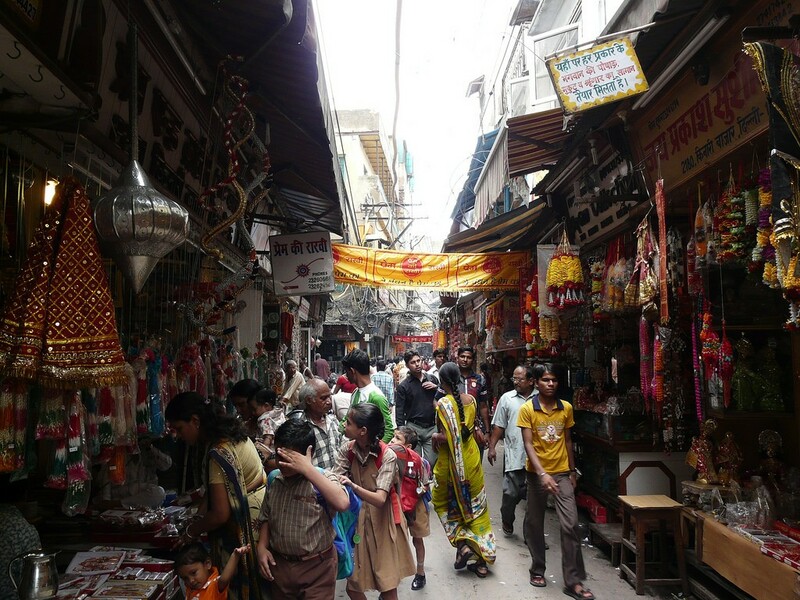 This is the place where some of the finest jewelry in Agra, as well as fabric, clothing, shoes, authentic snack stalls, and Agra’s famous marble-work can be found. It is also the go-to place for any tiny tidbits related to weddings, like beautifully crafted garlands, bridal veils, and groom turbans. Opening hours: 11:30 a.m.–6 p.m. 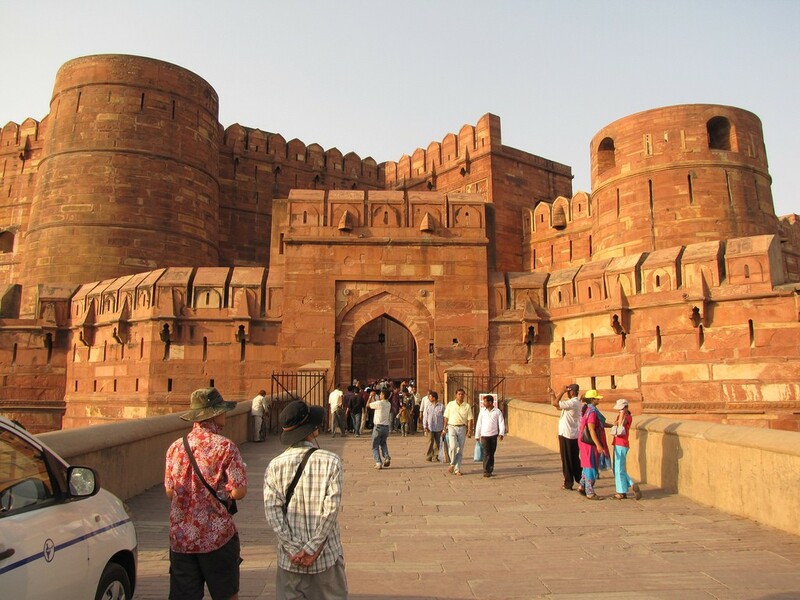 Located on the Agra-Fatehpur Sikri highway, Korai village is home to people belonging to the Kalandhar tribe. 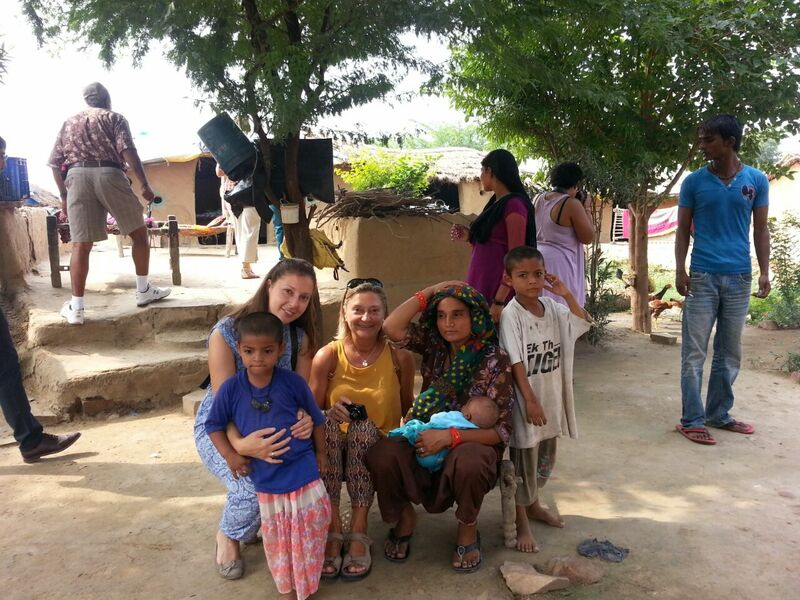 A day trip to experience the kind of life they live will not only show you what rural life in India is like but will also give an inside feel of their simple lifestyle—their huts, how they cook their food, and how they drink water using a hand pump. The people of this village now earn a livelihood through these day tours, as the money collected is used to purchase everyday items such as food, rations, and stationary for the kids. These items are then equally distributed among the families. Prior to this, the villagers kept bears and they would host several bear dances to entertain visitors and earn a source of income. However, they had lost this opportunity once the government acted upon animal rights. Foreigners visiting the village has had a positive effect on the people of Korai village and they look forward to entertaining tourists and educating them about their lives. A tour can easily be booked by filling out a form on their website, and the visiting charge is only $10 per person, which is directed towards the village’s welfare. A great initiative that was started by a group of individuals to conserve India’s wildlife, Wildlife SOS is a great place to visit to spend some time with the animals as well as educate yourself regarding the current situation regarding animal cruelty in India. Although Wildlife SOS initially started to rescue the “dancing bears” of India, it also runs active projects to provide shelter and help to leopards, elephants, reptiles, and other animals. Wildlife SOS offers a personal two-hour guided experience that you must pre-book. This involves a guided tour of the facility, a documentary to explain the history of the dancing bears, and activities to interact with the bears, such as feeding them fruit or porridge. The center is open seven days a week, from sunrise to sunset.